Best lightweight mobility scooter ramp? Best foldable mobility scooter ramp? Best portable mobility scooter ramp? Now that you have found the perfect mobility scooter either for yourself, for a friend or for a family member, it is time to start adapting the surroundings to make using the scooter easier and more convenient. Many new mobility scooter or all-terrain knee scooter users will soon discover that – unfortunately – there are a lot of places that aren’t exactly mobility scooter friendly, but there are a few precautions you can take to minimize the potential struggle. Investing in mobility scooter ramps is one way to make sure you won’t ever get stuck at the curb or when trying to get up a step somewhere, because while it should be everyone’s right to move around freely – it is always better to be prepared. Access ramps for scooters are invaluable scooter accessories when relying on a scooter to take you where you need to go, so let’s have a look at some of the best products out there. 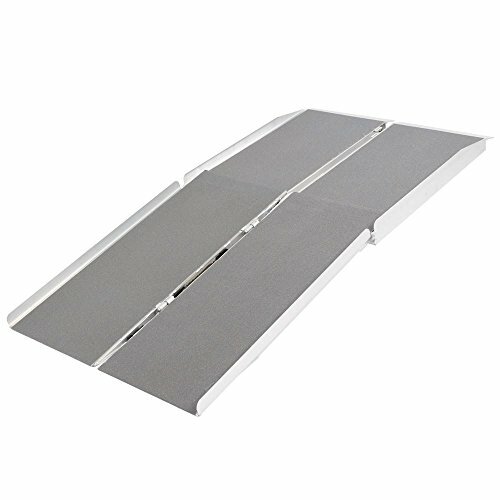 These portable wheelchair ramps are 30” wide and provide maximum stability and support when driving up and down. It can hold a total weight of 800lbs, which is fairly high for this type of product, and it folds up conveniently and can be carried like a suitcase with the handle on top. This suitcase ramp is a ramp for scooters and wheelchairs, it has several different wheel configurations and is covered with anti-slip material for safety and convenience. It also comes with a safety instruction video and safety pins, making it a reliable option when looking for suitcase ramps for wheelchairs and mobility scooters. Why We Liked It – This durable portable ramp for mobility scooter users is heavy duty and can support a weight of 800lbs, making it a product that will last long. Big plus for the included instruction video. Here we have lightweight ramps mobility scooters will easily get up and down, and they can be used for getting up the curb, down the porch, into a minivan or onto any other reasonably high surface. This multifold wheelchair ramp can even get your mobility scooter up the back of a smaller pickup truck, which makes transporting the scooter incredibly easy and hassle-free since no heavy lifting is needed. This multifold wheelchair ramp for mobility scooter users weighs a total of 46 pounds, it folds into a suitcase just like the Prairie View Industries product above, which you then carry with the paddled handle, and it can be stored virtually anywhere as this van ramp takes up very little space. 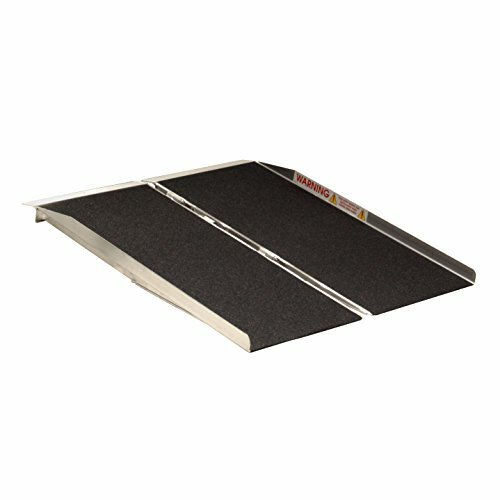 These wheelchair and scooter loading ramps for vans also have a 600lbs weight capacity, anti-slip material for safe usage also in poor weather conditions and they come at an affordable price. Why We Liked It – One of these easy-to-use mobility scooter loading ramps will provide the stability and safety you need to move your mobility scooter to where you want it to be, and the multifold wheelchair ramp stands out for its length! Move your mobility scooter or wheelchair from one surface and onto another with this cleverly designed ramp for scooter users. It is very light-weight and simple in its design, it has perforated holes along the ramp system which drains water and prevents it from collecting on there during rainy days – making it significantly safer to use. When looking at scooter ramps for sale on the internet, it is important to pick one that meets your needs and fulfills regular safety standards. This product has a 600lbs weight capacity and comes with a practical carry bag for easy transport. Why We Liked It – The perforations in the base of this electric wheelchair ramp makes it fine to use even during heavy rain or if having left it outside overnight. Suitcase ramps for wheelchairs and mobility scooters like this one are convenient options due to the fold-up design that allows you to store it easily. It is perfect for getting up steps, curbs, porches, getting it into a van or a truck and landings, and it can easily be brought along on a trip somewhere due to not taking up much space. These Titan ramps for vans only weigh 30lbs; which is less than many similar electric mobility scooter ramps, this van ramp is made with durable aluminum that won’t rust and it has a maximum capacity of the somewhat average 600lbs. It has a serrated surface which prevents you from slipping, and it folds up to half its regular width. Why We Liked It – This is one of the most lightweight ramps for mobility scooters reviewed here, which is convenient if having to carry it (it has a padded handle). 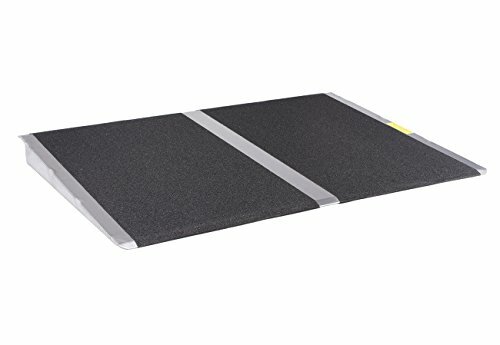 This 5ft mobility scooter ramp is longer than many other similar product options out there, and it is recommended for surfaces with an elevation of up to 10* when used with a wheelchair or a mobility scooter, and for surfaces elevated with up to 15” if walking. It is made with rust-proof aluminum and it is durable welded – with anti-slip material covering the whole base and a maximum ramp weight capacity of 600lbs. What makes this product unique is that it doesn’t just come with this particular ramp length and width, but instead a variety of size-options can be chosen, so that you can find portable ramps for mobility scooters that perfectly fit your individual needs. Why We Liked It – While above review is for the 5ft size, there are several different fold ramps to choose from, which makes this a very versatile option when choosing portable folding ramps for folding mobility scooters. For wheelchair and mobility scooter users – something as small as a threshold can present a rather big obstacle. These wheelchair and scooter ramps are meant to resolve that issue, by providing an easy way to get up on one side and down on the other. It is made entirely from durable rubber, which won’t slide around once put in place. These threshold ramps can easily be brought along with you and used wherever there is a threshold or an edge that you can’t get around, something that can make an outing with friends or family a lot less of a hassle. The threshold wheelchair ramp is large enough to make the transition smooth and comfortable, yet easy to move and transport. Why We Liked It – Thresholds are something most people never think twice about, but for those with movability issues – it can be a real problem. Threshold ramps cleverly solves an issue that might otherwise limit a person in their right to complete independence and freedom, and this threshold wheelchair ramp is made from a sturdy material that is likely to last for a long time. While many products require you to buy two in order to safely get past a high threshold (one for each side), this right here is a convenient pack that includes both pieces that you need when trying to get around as effortlessly as possible. 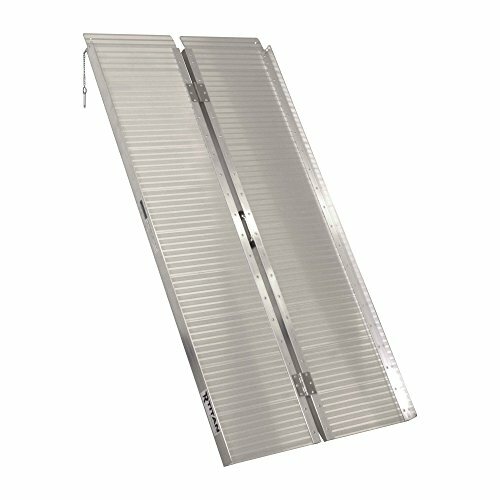 Not only can it be used for thresholds either, but this threshold wheelchair ramp can also help you get up or down the curb or sidewalk, or anywhere else where a low obstacle is blocking your way. These access ramps for power chairs of all types are surprisingly lightweight, weighing only 7.7lbs each, and it can handle the impressive maximum weight of 6.600lbs, meaning even a car can drive up it. The power chair ramps are made from a compound plastic material, and the pack includes one black and one yellow piece. Why We Liked It – Considering how little these portable ramps for scooters weigh – it’s surprising how much weight they can actually support! Perfect to take with you out and to help you get up and down the sidewalk or over a high threshold when for example going into a smaller store. Suitcase ramps for scooters – also known as briefcase ramps – are easy to transport, which is probably why they are so popular among users. This product is intended for scooter users and those using a wheelchair, and not intended for walking up and down it, as the material isn’t quite apt for walking. 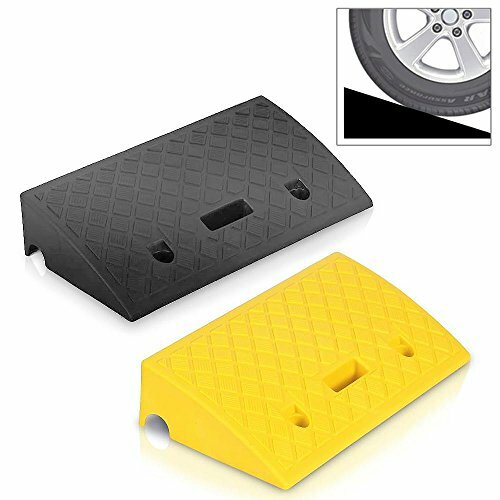 It has a serrated top which is great to prevent wheels from slipping, but not good enough to guarantee the safety of someone walking up or down it with shoes. It weighs only 21lbs and measures 48” L x 30” W, and it is reduced to half its width when folded up like a suitcase. An integrated nylon handle is there to make it easier to carry. Why We Liked It – These types of mobility scooter car ramps are great for someone who wants a light-weight option with good security features. No-slip, and holes to secure the mobility ramp with bolts if needed, when planning to keep it permanently in one place. Looking for a solid- and wide electric scooter ramp that can hold for up to 800lbs? Then this product might be the one you are searching for! It can accommodate rises of as much as 3”-6”, which can significantly facilitate a mobility scooter- or wheelchair user. The platform has a full width of 36”, durable anti-slip and no-slide material that will keep the chair or scooter from wobbling and a lifetime warranty to guarantee customer satisfaction. Handicap ramps for electric mobility scooters need to be reliable, and this manufacturer’s confidence in its own product sends out just the right signals. Why We Liked It – When getting a power chair ramp you don’t want to have to worry about it not supporting the weight that will go on it, and with this product and it’s 800lbs weight limit – you are all set to enjoy your new product without a concern in the world. This is one of the largest mobility scooter ramps for sale that we have found – perfect for someone who needs to get up on slightly more elevated levels, or who wants less of an angle when getting up or down from something low. It can be easier for a wheelchair user or someone driving a mobility scooter to use it on their own since the mobility ramp length makes it less steep. It is made from rust-free aluminum with a no-slip tape covering its entire surface so that you can use it with absolute safety and comfort. 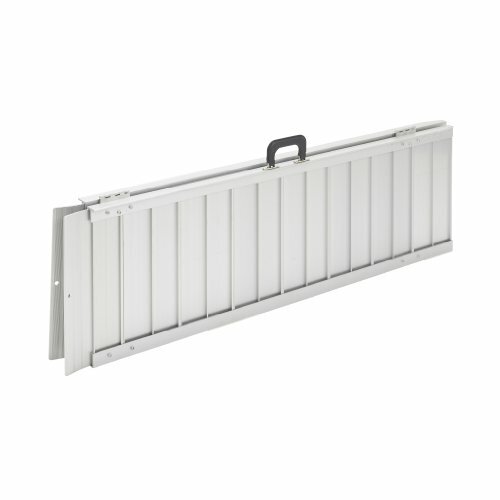 It is solid and does not fold but is lightweight enough to transport and store easily. Why We Liked It – Not everyone plans to be moving their electric wheel chair ramps around, so if you are one of those people who plan to keep it in a fixed location – a solid electric wheel chair ramp like this one becomes the perfect option. While society in many places has become more inclusive in recent years, and while there is a constant change happening – there is still a long way to go. When using a mobility scooter, it can become a big problem to get over a threshold either at your own home or when wanting to visit a friend or a store, and curbs and sidewalks can be near impossible to get up and down from. Handicap scooter ramps and threshold ramps can be a way for those in need to gain- or regain their independence, as many of them can be easily transported and brought along for whatever adventure you have in mind. It is important to look for a product that suits the needs you have, and also that suits your mobility scooter and/or wheelchair, in terms of the ramps weight capacity and design. There are so many different products out there with variating functions, so the best thing you can do for yourself is to take the time needed to investigate properly. It is also important for you to be honest with yourself when shopping for a travel scooter car ramp or motorized wheelchair ramps, because nobody knows you better than you yourself, and only you know with absolute certainty what you need in order for your life to become easier. Handicap ramps for scooter users can often seem like they are all the same, but the truth is that there are quite a few things to look out for and to consider before settling on a product to purchase. Don’t rush it, take your time, and be open to different types of products for the best end result. Travel scooter car ramps and any other portable wheelchair ramp for scooter usage is usually either made out of aluminum, rubber or compound plastic, which are the most lightweight materials for easy transport and management. You usually want to be able to move your electric wheelchair ramps, and by making power chair ramps portable they can be used for multiple purposes, as well as be taken along for trips and outings. Handicap ramps for high surfaces tend to be made with aluminum, as it is a durable material that can be left outside at the mercy of the weather conditions if needed, and they usually attach with screws and/or bolts. The material is easy to keep clean, it does not rust, and it looks discrete and stylish while also being highly functional. 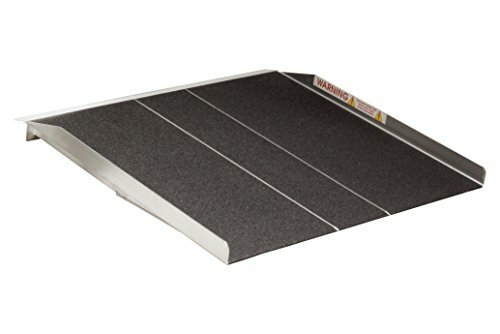 These types of scooter ramps for cars, porches, steps and much more tend to be covered with no-slip tape, to make sure that you can use it safely also on rainy or snowy days. Other products can be made of heavy duty rubber or plastic, which are great materials with a natural anti-slip effect, that stay put where placed, and allows for a simple transition over objects. These tend to be a solid-type ramp that scooters can easily pass over and are in most cases used to get over thresholds or other low-standing objects, rather than to get up steps or too high platforms. These material variations are different, but they also tend to be for different purposes. A foldable mobility scooter ramps for cars, steps, porches and so on are convenient in a way that they can be made smaller for easy transport. They usually double down the middle and many have a clever briefcase style design, where you double your ramp, latch it and carry it with an attached handle. It makes it incredibly easy to move from one place to another, to pack into a car or to store where there is limited space when not in use. A solid ramp does not fold and is a great option when not planning to move the ramp around too much, like for example if you are going to use it to get up and down the steps to get in and out of your house. Solid ramps can feel a bit more stable to some individuals, and if you are not planning to stash it away or move it anyway – why would you need a foldable model? Both models are however perfectly apt for any mobility scooter needs, so it is really just a question of whether it matters if it folds or not and if you would like it to convert into something smaller and more manageable when not in use. The next thing to consider is the size you need your suitcase ramps, your electric ramp or your mobility scooter car ramps to be, as there are quite a few different options out there. Wheelchair users will usually need a wider ramp, while those riding some types of mobility scooters could get away with a slimmer version. 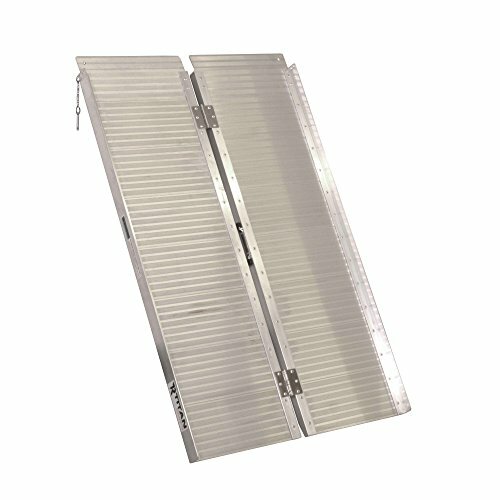 Always pay attention to listed measurements, because when buying handicap ramps for scooters mobility is the main objective, and you will get nowhere – quite literally – with for example power wheelchair ramps that are too small for your actual wheelchair or scooter. Mobility scooter ramps for vehicles also need to fit your car the way you have intended for it too, so it is also of utmost importance to properly measure your car door opening or whatever other space you plan to use your ramp for. A scooter ramp for SUV owners might need to look different than electric wheelchair scooter ramps for cars of other models, but if you keep the correct measurements at hand – you will be more than fine. If you just need a small product to get you over thresholds, up and down the curb or over low objects, then the ‘Pyle Portable Lightweight Curb’ is an excellent option. It only weighs 7.7lbs, yet it can support up to 6.600lbs without budging! This means you could use it for your mobility scooter, and someone else in the family could use it for their motorcycle or even for their car, which is quite impressive considering how light they feel when you pick them up. They are perfect for carrying around with you since they barely weigh anything at all. If you are looking to get higher up with your mobility scooter ramp, however – we recommend the ‘4’ ft Briefcase Ramp’ which is only 21lbs and folds up like a briefcase. It is significantly lighter than many other similar briefcase-style products; compared to some even half as light, and it has a practical handle so that you or someone accompanying you can carry it around for a while when moving from one place to another. The ‘Prairie View Industries SFW330’ is superior in terms of weight capacity, at least when it comes to foldable mobility scooter ramp models, as it can handle up to 800lbs (when most other similar makes have a limit of 600lbs). The manufacturer has thought of user safety and satisfaction, which are two essential aspects to keep an eye on when shopping for this type of product. The SFW330 folds like a suitcase and is carried around as such, and it makes a great wheelchair ramp/ scooter ramp for a car owner, as it is both long enough and sturdy enough to get you up and into a car with your wheelchair or mobility scooter. There is also a convenient handle so that you can carry the ramp around if needed. While many of above-mentioned products are very similar in function and design, we would like to name the ‘Drive Medical Singlefold Wheelchair Ramp’ one of the best foldable portable ramps, since it is lightweight and comes with a carry bag! Yes, many of the other options are also very portable since they fold up, but this product has a bag that will protect it from damage during transport, which comes in handy when traveling with a lot of bags, items, and gear. It also has small holes drilled for draining water in the case of rain, so that the ramp can be used without delay also in poor weather conditions. Try not to feel overwhelmed when sitting down to pick a scooter ramp, because there are many good options out there, and all you need to do is to think of what you need for it to accomplish. Be honest with yourself, make lists, and compare product information, features as well as pros and cons. Knowing what you want before you start looking will save you both time and headaches, and in the end – you are the only person who can make those decisions. 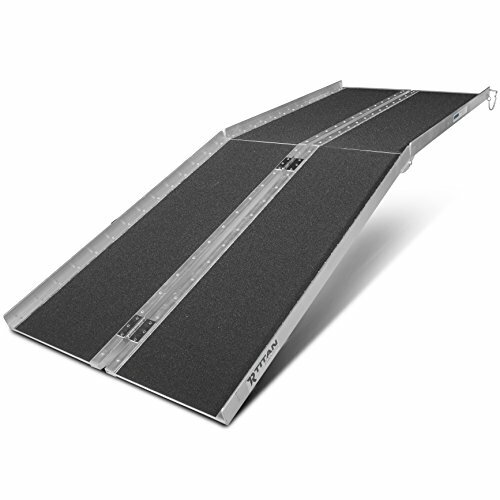 Pick a ramp that suits you and your needs and see how much easier it can make everyday life. Remember that while two products might look very similar – they could have entirely different features. Always check for measurements and the access ramps weight capacity, to make sure you get the product best suited for your needs and don’t make the mistake of thinking that products that look the same will actually be the same. Several organizations worldwide are working daily to inspire business and public places to make their facilities more scooter and power wheelchair accessible, but it takes time and effort, and until global inclusiveness and accessibility for those using a power wheelchair or a scooter becomes a reality – it is a good idea to have your own wheelchair ramp scooter ramp ready in case you end up needing it.